With so much unique richness, defining Miami by just a few characteristics can be limiting. What was clear is that there was a definite local perspective about Miami, which required going beyond just South Beach to capture the passionate culture, energy and rhythm that makes Miami feel fresh vibrant and alive. Target: The Neo-Yuppie are drinkers who are creatively minded and socially active 21-35 year olds, educated, urban sophisticates with international sensibility. They are in the know, seek out trends slightly ahead of the curve and bring them to their friends in order to stand out and impress. 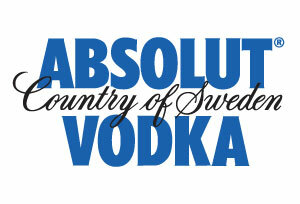 The objective of the campaign was to generate awareness and excitement among Neo-Yuppies for the launch of ABSOLUT MIAMI, the limited edition flavored vodka from ABSOLUT. The campaign needed to bring to life the “From Dusk till Dawn” concept and “Exceptional Drinks, Exceptional Experiences” call to action through first-to-market opportunities and vibrant large format customized OOH experiences that would encourage engagement and excitement while giving Neo-Yuppies the tools to find out more about the brand. Create exceptional experiences throughout the city that excite people and encourage them to share these experiences. 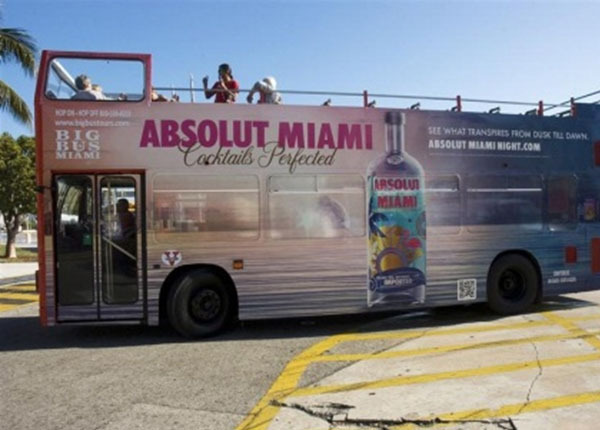 Use targeted street furniture, mobile OOH and high profile large-format spectaculars to communicate the launch of ABSOLUT Miami throughout the Miami DMA. 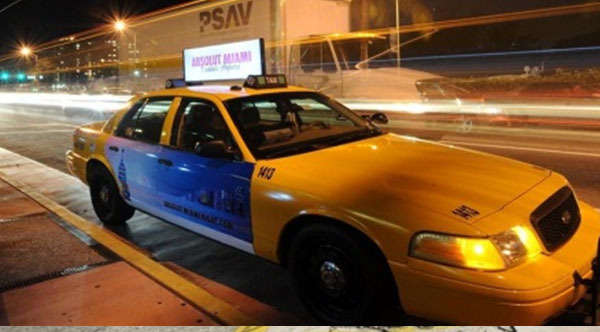 Generate buzz, excitement and greater consumer engagement via custom created OOH experiences that are designed to align and bring to life the “Turn up the Miami” concept. Media format selection was based on high-impact, alcohol approved sites, which would penetrate select neighborhoods and deliver mass awareness amongst core audiences. First-to-market opportunities generated excitement and intrigue in the market. Tactics considered other than OOH included: digital, spot radio, PR events, trade outreach, on- and off-premise merchandising, and on-premise promotions. 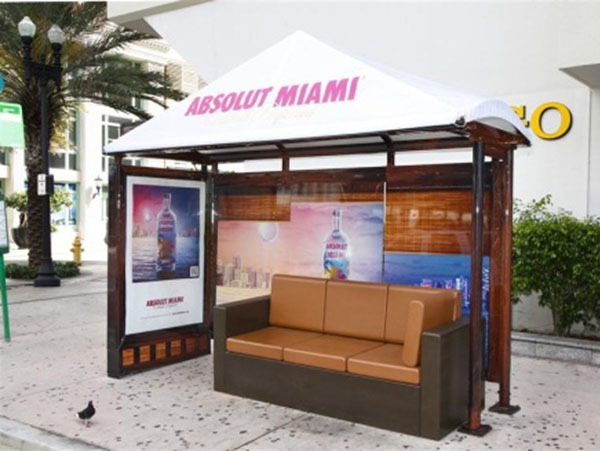 ABSOLUT Miami was the first advertiser to create fully wrapped, branded bus shelters in the city of Miami. 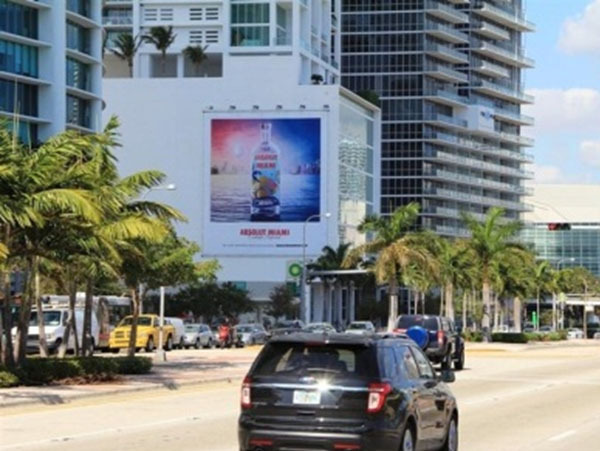 Throughout the OOH execution, which accounted for 60% of the overall media budget (with other media starting later in the campaign), search volume for “ABSOLUT Miami” experienced significant growth (0-100%) from the very start of the OOH campaign and dropped off at the end of the OOH campaign (most searches coming from Florida region). The biggest peak was January 15-21, when the OOH program started running.